Strong winds and heavy rain have caused travel disruption and flooding to parts of the UK. Storm Bronagh, the second named storm of the year, swept eastwards across Wales and England overnight, with gusts reaching 78mph. Flooding and fallen trees have caused problems on the roads and disrupted rail services. Sheffield and Sennybridge, Powys, both got around half a month’s rain fall in 24 hours. A yellow weather warning for wind is in force for parts of England and Wales until 18:00 BST on Friday. However, forecasters said the impact of the storm was “waning” and will mainly affect offshore areas in the north east of the country. Speed restrictions were in place for many trains across the network in Wales and the west and north of England. Some LNER train services on the East Coast mainline have been cancelled because of damage to overhead lines near Durham that engineers worked overnight to fix. Arriva Train Wales, Great Western Railway, Southeastern, South Western Railway and Thameslink services have also been hit by delays. The strongest gust during Storm Bronagh of 78mph was recorded on the Isle of Wight. 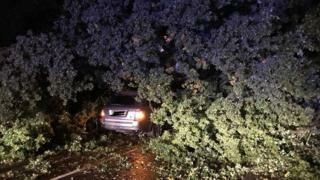 In Nottinghamshire, a man escaped injury when a huge tree fell on his car on a rural road at 02:00 BST. The driver managed to get himself out of the vehicle but was described as “clearly shaken” by the fire service. Multiple flood warnings were in place in south Wales and England on Friday morning, as well as more than 60 flood alerts. 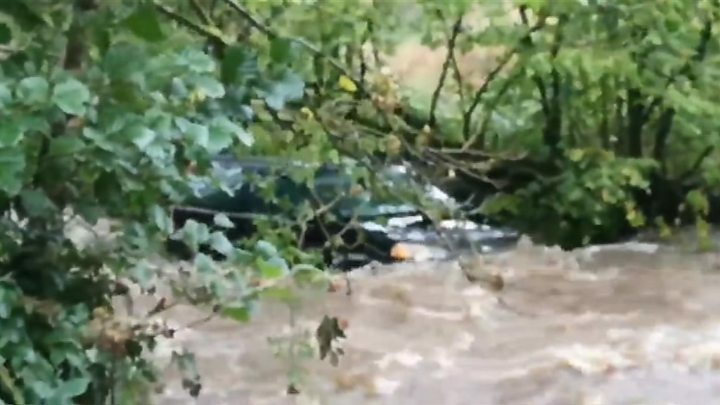 In Cynghordy, Carmarthenshire, a car was swept down a river on Thursday, but no-one was inside. 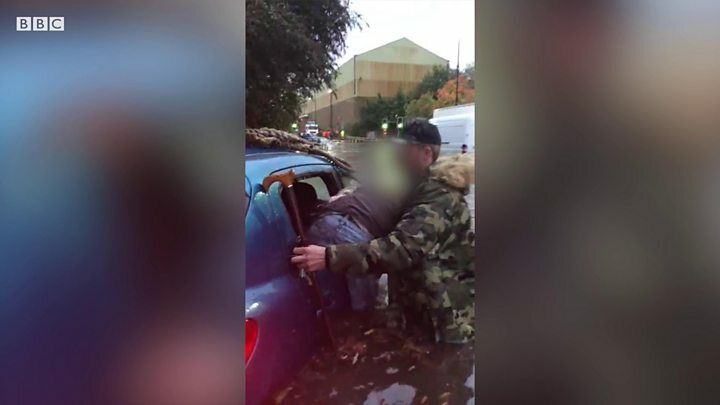 One video showed a man rescuing an elderly woman from a car that was surrounded by flood water in Tinsley. Pictures posted on social media showed vehicles with flood water up to their bumpers on a road between Sheffield and Rotherham. East Midlands trains said there had been severe flooding in Sheffield station and warned customers to take extra care. Ali, Idris, Lily: Why do storms have names? The Met Office spokesman said the departure of Storm Bronagh from our shores meant “reasonably good weather conditions” are expected over the next few days. Forecasters are anticipating the arrival of another low pressure system on Sunday, although the Met Office said it will “perhaps not as bad as first feared”. A yellow weather warning for wind has been issued for parts of England and Wales on Sunday between 09:00 and 23:59 BST. Two people died when Storm Ali, the UK’s first named storm of the season, battered the UK and Ireland on Wednesday, with winds of up to 100mph. A woman died after the caravan she was in was blown off a cliff in County Galway in the Irish Republic. A man in his 20s was killed and another in his 40s was injured, after a tree fell on them at the gates of Slieve Gullion Forest Park, near Newry, County Armagh. Have you been affected by Storm Bronagh? Share your pictures, video and experiences by emailing haveyoursay@bbc.co.uk.